A graduate of the University of Manitoba and the Asper School of Business gave back to his alma mater today with a $5 million gift. Entrepreneur Stu Clark presented his cheque today to President and Vice-Chancellor Emőke J. E. Szathmáry and Dean Glenn Feltham at a special gathering at the Fort Garry Hotel. The event included Leonard Asper, son of the late Dr. Israel Asper after whom the School is named community leaders from business, government and university, and students. Dean Feltham announced the renaming of the Centre as the Stu Clark Centre for Entrepreneurship. 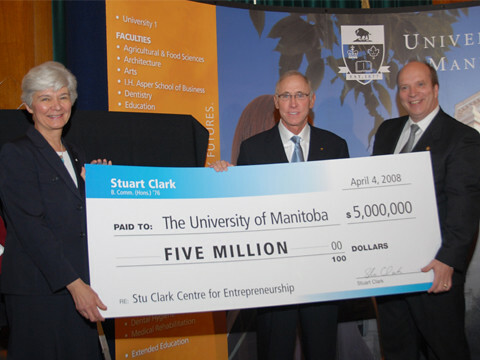 The goals of the Stu Clark Centre for Entrepreneurship are to strengthen entrepreneurship within the School and University and to encourage the development of new businesses and entrepreneurial thinking across Manitoba and Canada. The Centre maintains its link to the Asper name through the executive director’s position of I. H. Asper Executive Director for Entrepreneurship. Dean Feltham said the gift is in itself a turning point in the history of management education at the University of Manitoba. The Centre’s track record for faculty, student and graduate accomplishments are among the best in the world. For instance, three students in Warren’s New Venture Analysis course – team Civitech – recently swept judges off their feet at Carnegie Mellon University’s 2008 McGinnis Venture Competition, bringing home a total of $45,000 in prizes and in-kind services. As is often the case, team Civitech was the first and only team representing Canada at this competition. Since 1995, student teams have had 38 first-place wins. With the Civitech win, Warren earned the record as business school advisor with the most number of wins at international business school competitions. The Centre hosts several youth programs, including the summer Curry BizCamp in Entrepreneurship. It also hosts the Stuart Clark Venture Challenge, a student competition for new, independent ventures in the seed, start-up or early growth stages. The Challenge started yesterday and runs until tomorrow. Team Civitech will be competing, as well as 13 teams representing 12 universities. As in past years, teams from leading universities worldwide have competed at the University of Manitoba competition. Media are invited to the final rounds of the competition, tomorrow, April 5, from 1:00 to 4:30 p.m. at the Fort Garry Hotel.